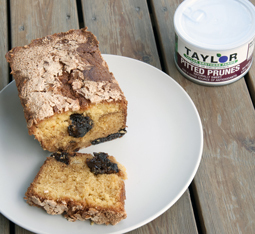 Rustic Prune Cake - A recipe from Savor California, the online showcase for extraordinary gourmet foods and beverages from California. Mix all the ingredients except the prunes. Grease a 5" x 10" loaf pan with butter. Pour the mix into the buttered pan. Place the prunes evenly in the mix. Bake at 300 degrees for 45-60 minutes.